Working Group Membership: Communications Working Group, Counter ISIS Finance Group. Italy – together with the United States and Saudi Arabia co-leads the counter- ISIS Finance Group (CIFG) aimed at identifying and disrupting Daesh sources of revenue and financial networks. Building upon the strategy to counter Daesh’s financing enshrined in the CIFG’s Rome Plan, approved in March 2015, Italy has been working with the Global Coalition partners to: identify and disrupt Daesh’s access to regional and international financial systems, limit Daesh’s global financial networks and its geographical affiliate, strengthen international anti-money laundering and counter-terrorist financing measures. In this regard, stepping up financial intelligence sharing within the Coalition is critical to increasing coordination with our partners on technical assistance offered to the Countries most exposed to Daesh’s threat. At the national level, in the last few years, tougher legislation on countering terrorist financing has been approved, providing judicial authorities with stronger, more effective tools. In addition to introducing new criminal legislation to crack down on individuals financing – or providing other kinds of support- to terrorist groups, Italy has implemented restrictive measures targeting self-trained jihadists and foreign terrorist fighters. A dedicated interagency body, the Financial Security Committee, is entrusted with the power to supervise this comprehensive process, ensuring an in-depth, consistent application of relevant legislation and increased information sharing. Our Country is one of the main actors in the Foreign Terrorist Fighters (FTF) working group to counter the flow of terrorists trying to cross borders. By boosting cooperation among security forces across the Coalition the FTF Working Group guarantees the sharing of information collected by Coalition forces in fighting terrorism, resulting in enhanced homeland security. We are promoting deeper coordination between intelligence and law enforcement agencies to monitor and prevent the flow of foreign fighters. Therefore, improving information sharing and cooperation helps preventing radicalization and reduce the likelihood of attacks. Daesh uses social media to spread terror and brainwash vulnerable people. Daesh propaganda still poses a threat, despite its shrinking territorial presence. Italy is a member of the Communication Working Group and contributes to the Strategic Communications Cell whose mission is countering Daesh’s propaganda and fighting their flawed narrative and heinous ideology. Italy is engaged in making the internet a safe place and strengthening community resilience against radicalization. We engage digital platforms and media outlets to prevent them from becoming Daesh’s repositories and echo-chambers, enhance early detection of extremist content and speed up the removal process. Italy is among the top contributors to the training in favour of the Iraqi Security and Police Forces with almost 30% of the Coalition effort. In total, more than 26,500 units have been trained to support Iraqi Government in building the military capacity of the Iraqi Government. These figures rise up to 44,500 units, including 18,000 units of the Iraqi Police trained by Carabinieri Task Force for Stabilization activities. In particular, the Italian Army has trained more than 17,000 units in several fields such as Infantry, Artillery, Counter Improvised Explosive Devices, Sharp Shooting, and Intelligence and delivered several tons of equipment to the Iraqi military Forces. Moreover, Italian Special Forces Units, involved in Military Assistance activities have trained more than 9,500 Special Forces units on several fields such as Anti-Riot, Close Protection, Sensitive Infrastructures, Special Purpose Course Terrorism, Sniper, Advance Combat Skill, Combat Medic and Short Distance Shooting. Italian Air Forces have supported Coalition endeavours, by performing over 23,000 flight hours for patrol, transport, reconnaissance, rescue sorties and air-to-air refuelling. Stabilization of Iraq and Syria is one of the crucial points for defeating Daesh: it is necessary to ensure security and stabilization and promote reconstruction activities across the liberated areas. 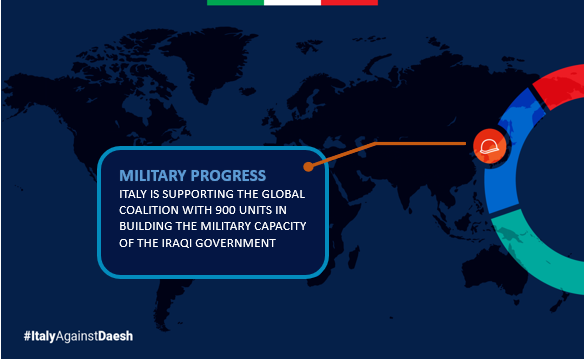 Italy is actively supporting the Global Coalition’s efforts to strengthen the military and security capabilities of the Iraqi Government and is the leading partner in training Iraqi Police Forces to ensure security and rule of law in liberated areas. Furthermore, Italy has been one of the first and more coherent contributors to the UN Fund for immediate stabilization (FFIS). In particular, the Carabinieri Task Force has trained more than 18.000 units, by delivering specific stability policing training such as Law and Order Course, Police Techniques and Procedures, Law Enforcement course, High Risk Operations Course, Female Police Officer, Counter Improvised Explosive Devices (C-IED) Detection, Community Policing Course, Police Advanced Training, Counter Terrorism, Cultural Heritage Protection, Crowd and Riot control, Close Protection Basic Procedures and Crime Scene Investigation Course. Courses are attended by Local Police, Federal Police, Swat, Border Police, Highway Police, Kurdish Police and others. In Iraq, Italy will continue to support local partner forces to stabilize and protect liberated territory by cooperating with local Iraqi authorities, to make their cities safe and provide assistance to local populations.